The Artist Review. The most awarded French film in history and winner of five Academy Awards, including Best Picture, Best Actor and Best Director, The Artist succeeds entirely as both an engaging cinematic experience and a painstaking evocation of a bygone age. The most awarded French film in history and winner of five Academy Awards, including Best Picture, Best Actor and Best Director, The Artist succeeds entirely as both an engaging cinematic experience and a painstaking evocation of a bygone age. The upcoming Blu-ray edition of this feted film, to be released locally on June 28, contains both an immaculate rendering of the print itself and a number of worthwhile bonus features. 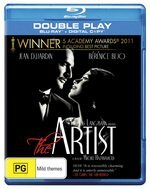 On offer are a 22-minute Making Of Featurette entitled The Artist: The Making of An American Romance; an insightful and upbeat 45-minute Q & A with the Cast and Filmmakers (including Dujardin, Bejo and director Michel Hazanavicius); The Artisans Behind the Artist, a series of four Behind the Scenes Featurettes on the Production Design, Costuming, Music and Cinematography; a short Locations Featurette and a (silent) Blooper Reel. An audio commentary or two would’ve been a nice touch, but overall there are some well-chosen additions to the main feature and fans of the movie won’t be disappointed by the array of extras on offer.